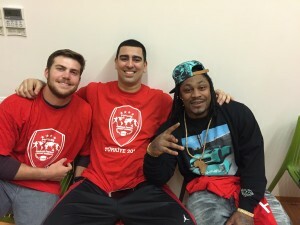 Hey its Marshawn. 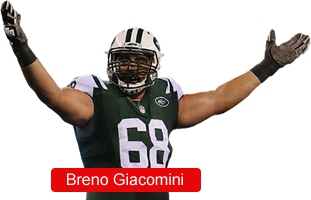 It has been great to help out our former teammate Breno Giacomini (Pictured Above) with his AFWB charity. Today was the first day of camp and we hosted the University Football Federation and Turkish American Football Federation teams. The morning consisted of non-contact drills and the afternoon was full contact. Throughout the day I was paired with fellow Carolina Panthers Running Back DeAngelo Williams and Coop was paired with Cleveland Browns Special Teams Ace Johnson Bademosi. 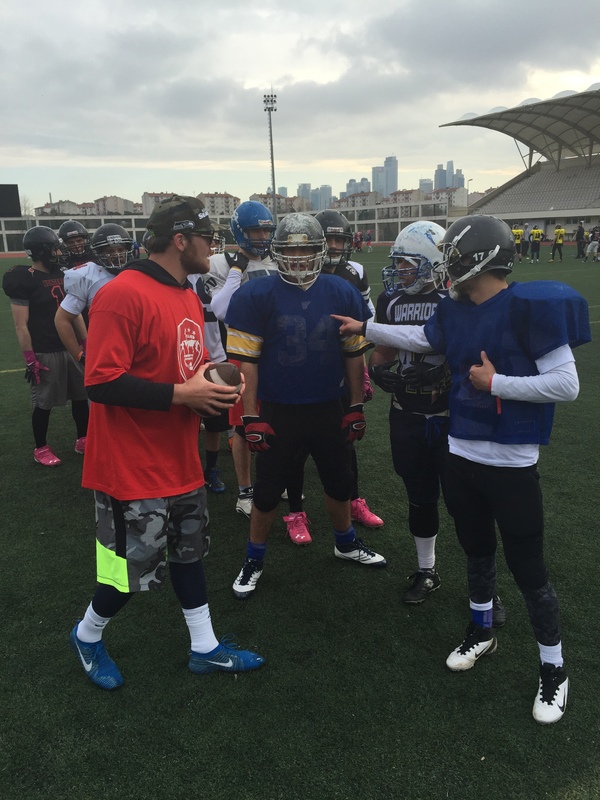 The highlight of day was when a Turkish Reporter asked to have a “Taste” of American Football. 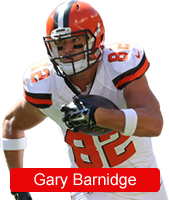 We suited him up, had him sign two waivers, and sent him straight into our tackling drill. Of course I wanted to take it easy on the reporter because I usually have so much to say to them. I will let you watch the video to see the results…. Good news is the Reporter is okay; however the bad news I think he may have retired from football after his first day playing. The reporter was a great sport and here is a picture of him after the hit with Will Svitek (Tennessee Titans) and Barkevious Mingo (Cleveland Browns). Also, after the tackle we made sure we taught the players to tackle correctly. This player led with his head. One thing that is not natural to people that did not grow up playing football is tackling. On the field we saw a lot of great potential. Of course it helped that I was able to teach the quarterbacks how to throw the ball. Maybe I have a career as Quarterback after my Running Back days are over. All and all we have been having a great time in Turkey and the Turkish people have been great. Last night we were hosted at a Euro League basketball game and sat front row and were honored at half time. It was a cool experience to take in an international game. With that let me turn it over to Coop. What a great time we have had over here. Today was a lot of fun working with the players on different aspects of their game. Many have a great grasp of the fundamentals so we used this time to introduce them to a bunch of the drills we do at practice as well as back to my days at Duke University. 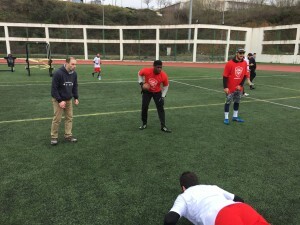 I worked mainly with the defensive backs – no don’t worry I am not switching to the defensive side of the ball they just needed some help – and I was able to show some of my skills throwing the balls during the drills. It was a lot of fun working with Johnson Bademosi (Cleveland Browns) as he brought a lot of energy to every drill we did. Tomorrow we have the teenage campers along with a group of women that play football coming, which should be a lot of fun. Also, I cannot wait to explore more of Istanbul. This city is pretty amazing with all the history surrounding the city. Make sure you connect with us with us social media to follow our travels as well as AFWB on Twitter, Facebook, or Instagram (afwbcamps). 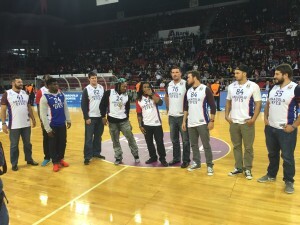 We have arrived in Istanbul, Turkey! 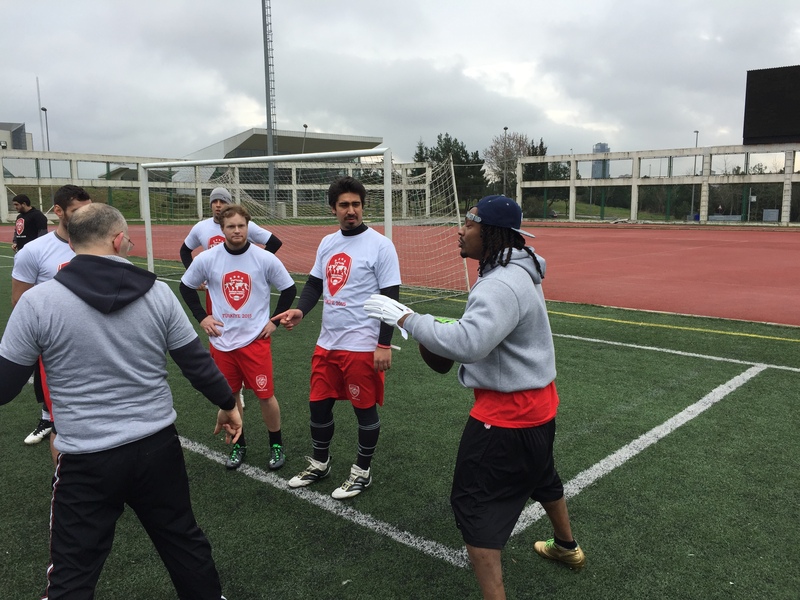 Ready to spread American Football as well as give back to the Istanbul communities. Amazing to think this city is over 7000 years old. Our hotel is located in Europe; however right across the Bosphorus River is Asia. It is crazy to think you can be on two different continents in five minutes. 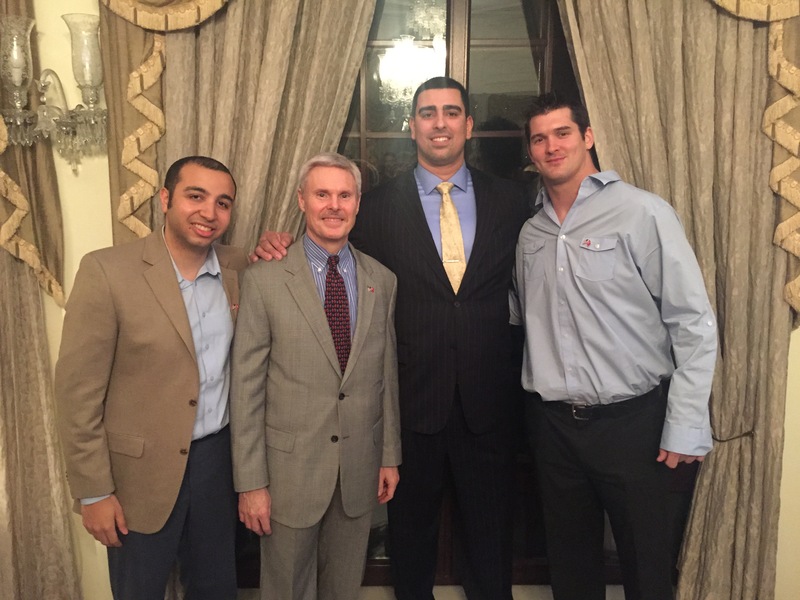 Last night Charles Hunter, Istanbul’s Consulate General, welcomed us to the US Consulate’s House. The party was a great way to kick off our camp as well as get to meet some great kids from the Special Olympics that we will be working with later in the week. Today we had our media event and there were a lot of great questions about the future of American Football in Istanbul. We were interested to find out that American Football was started in Turkey in 1980; however did not really start its growth until 2001 when the developing teams began to receive the equipment necessary to play American football and that has helped Turkey to structure their game more professionally. They even have produced one standout NFL football player – Tunch Ilken – who played twelve seasons with the Pittsburgh Steelers and one with the Green Bay Packers and was named to two pro bowls. 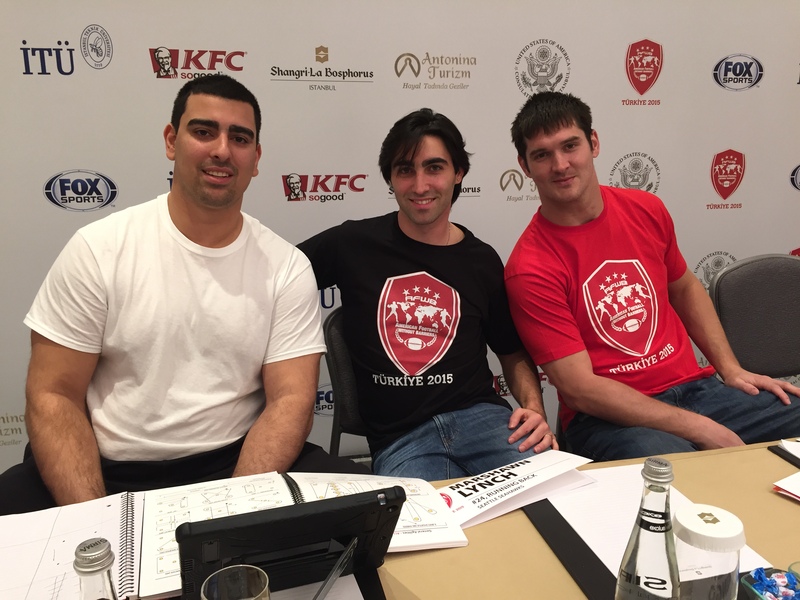 Today there are two main leagues – University Football Federation and Turkish American Football Federation. 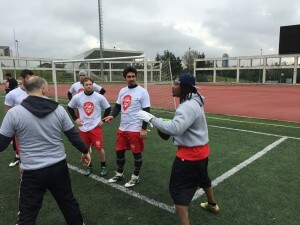 The University Football Federation caters to college and has 36 teams and Turkish American Football Federation caters to adults and has 20 teams. Additionally, there is Turkish website dedicated solely to College, Turkish, and NFL American Football called www.nfltr.com – Fox Sports even televised the Super Bowl this year with commentators in Turkey. 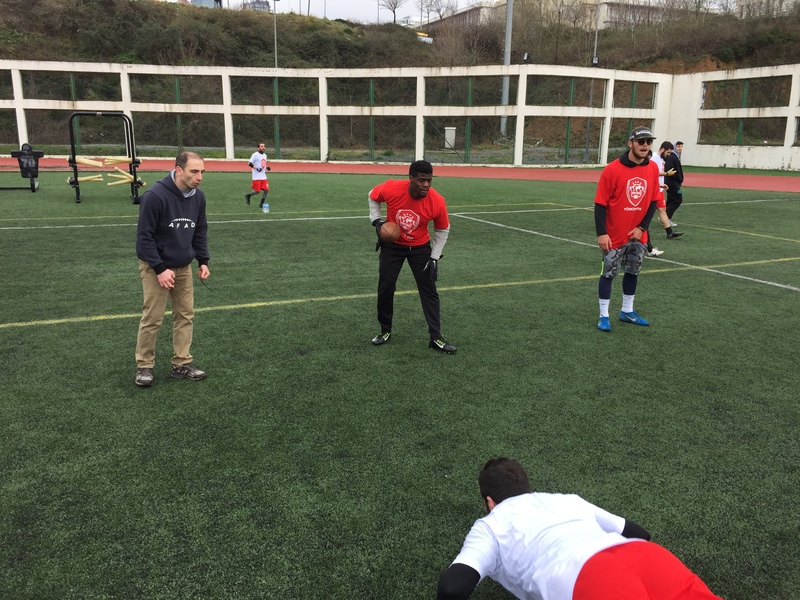 This afternoon Istanbul Technical University (ITU) has been gracious enough to allow us to use their facilities and host a Coaches Clinic for the Turkish American Football Coaches Association. Over 300 Coaches will be in attendance and we will be breaking down game films and providing drills to help further the game of American Football. 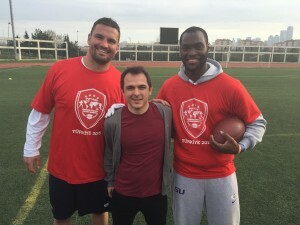 Erkin Palaz, one of the ITU Hornets Coaches and Player, has quickly become a great friend of AFWB Camps and has been instrumental in helping us get this event organized. 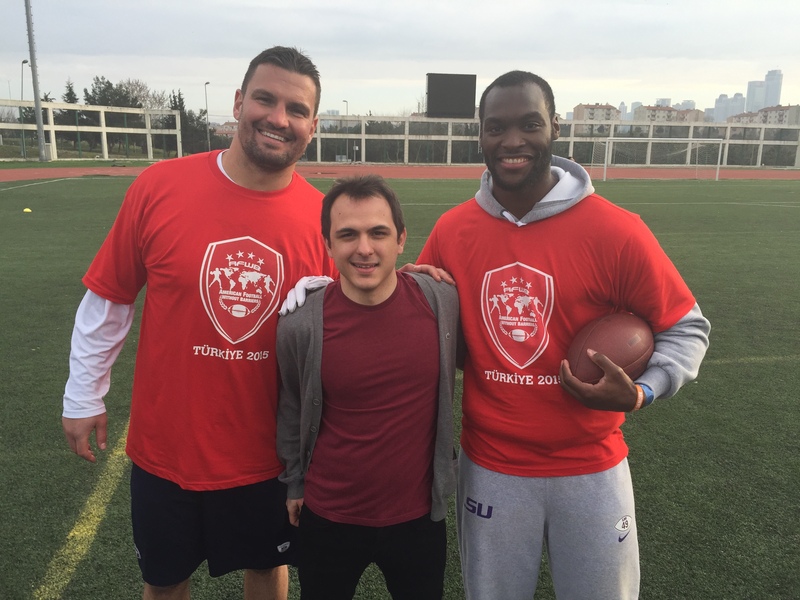 We are excited to be here in Istanbul and are hoping we will find several more players that will sometime have the opportunity to lineup next to us in the NFL. 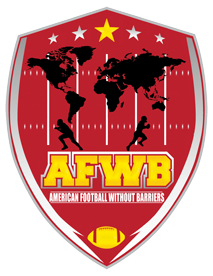 From now through March 6th be sure you follow AFWB Camps – @afwbcamps / www.afwbcamp.com / instagram / facebook – as well as the social media outlets of our NFL players in attendance. Can’t wait to experience the Turkey culture and meeting our Turkish fans.